I wanted to post about this on Friday, but something was up with WordPress and I couldn’t upload any pictures. It has been gross here in NJ since Friday morning, and since my classes that day were a week ahead (I started last Friday) I decided to do some rainy day stories with the little kids. 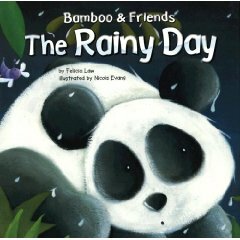 For Kindergarten and 1st grade, I read Bamboo & Friends: The Rainy Day by Felicia Law. I was totally unfamiliar with this series of books, but it was kind of charming and straightforward. It had a few little facts about pandas and rain throughout the story, which was nice. Some of the facts needed extra explanation for the little kids, and some of them were randomly placed in the story which made it hard to work them in. It was a short little book with nice illustrations, fine for what I needed it for. 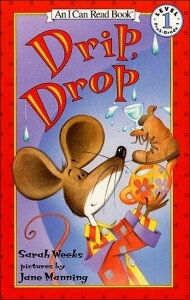 I also read Drip, Drop by Sarah Weeks, which was a great little easy reader. Pip Squeak the mouse is trying to sleep during a rainstorm, but his roof keeps leaking on him. 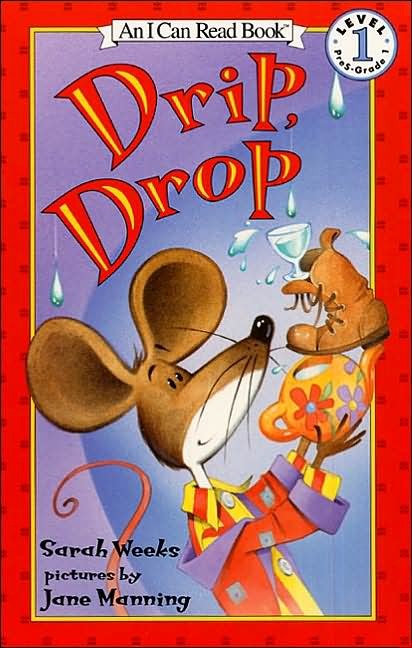 Rhyming texts and the repeated “Drip, drop! Plip, plop!” refrain helped the kids get into the story. My kindergartners thought it was hysterical, they could not stop laughing. After the stories, the kids drew pictures of what they like to do on rainy days. My 2nd and 3rd graders checked out books and caught up on stories I didn’t finish with them last week. The 4th and 5th graders helped me start decorating the library. Now that I’ve been there a week, I’m starting to think about the walls and the windows. So they helped me start a big paper tree for a column in the middle of the room. They cut out apples for each class so I can write the teachers’ names on them and put them on the tree. They also made me some pumpkins for the specialty teachers, administration, nurse, and school counselor. I hope I can get the tree finished on Monday, when I only have 1 class (I have 8 on Fridays). I stayed 3 hours after school on Friday just cleaning out the office and figuring out what things were where.